We welcomed the new year with a renewed commitment to living healthy. Its hard to keep track on our aspirations but to succeed, make only one resolution. Your chances of success are greater when you channel energy into changing just one aspect of your behavior – and none is most important as being healthy. With a clean slate, it is not too late to feel inspired and motivated to re-make yourself into a fighting fit person. One such wellness resolution you can make is to exercise moderately for 30 minutes a day, eat clean wholesome foods and increase your intake of Ole, a powerful anti-oxidant produced by prominent direct-selling company QNET that can keep you energized, fit, and beautiful, inside and out. When your body breaks down food it produces molecules called free radicals. Cigarette smoke and radiation also produce free radicals. Over time, the damage from these substances can result in conditions like infection, cancer, inflammation, and heart disease. That’s where antioxidants such as Ole step in. Once you cut an apple, it begins to brown, but if you dip it in orange juice, which contains vitamin C (an antioxidant), it stays white. You can defend your body the same way by including rich sources in your diet. Pomegranates, coffee, and olive leaf extract contain such antioxidants. It’s a common conception that Vitamic C is our best resource to protect our immune system. But did you know that olive leaf extract, found in Ole, is widely considered the ultimate natural defender of your immune system, containing 400% greater antioxidant capacity than Vitamin C, and up to 40 times more polyphenolics than extra-virgin olive oil? Why is it good for you? The extract from olive leaves contains various trace elements that are vital to good health, including Vitamin C, iron, zinc, selenium, chromium, betacarotene, and a wide range of important amino acids. Olive leaf extract is also a rich source of antioxidants. 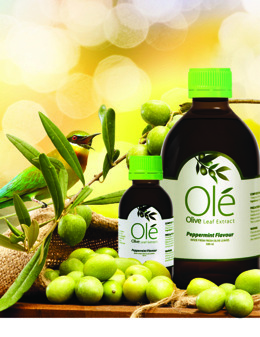 Traditionally, olive leaf extract has been used to treat fevers, cold and flus, common coughs and asthma. It is well known to help maintain a normal and healthy cardiovascular system and assist in the maintenance of normal heart function. Kick-start your healthy resolution and start having your one teaspoonful of Olé a day straight from the bottle, or mix one teaspoon of Olé with your fruit juice or your coffee in the morning. To stay fully hydrated, drink plenty of water, 8 glasses is recommended, in between your doses of Olé.